Silver is the more plentiful precious monetary metal known to man; gold is the other, which is less plentiful. As a result, silver has been much more commonly used in commerce. Silver is also the lowest priced of all the precious metals (gold, platinum, palladium, ruthenium, rhodium, osmium, iridium, and silver), thus making it an excellent value for bullion buyers seeking to own precious metals as an alternative to fiat currencies. This Highland Mint silver round is known as a "bullion round," meaning its price is determined almost exclusively by the price of silver. There's nothing particularly special about it, but many investors buy these types of rounds specifically for that reason! It may sound counterintuitive, but with simple bullion rounds such as these, there are fewer factors to keep in mind when determining the best time to sell. The obverse side of the coin shows Lady Liberty walking with her arm, wrapped in an American Flag outstretched with a rising sun behind her. 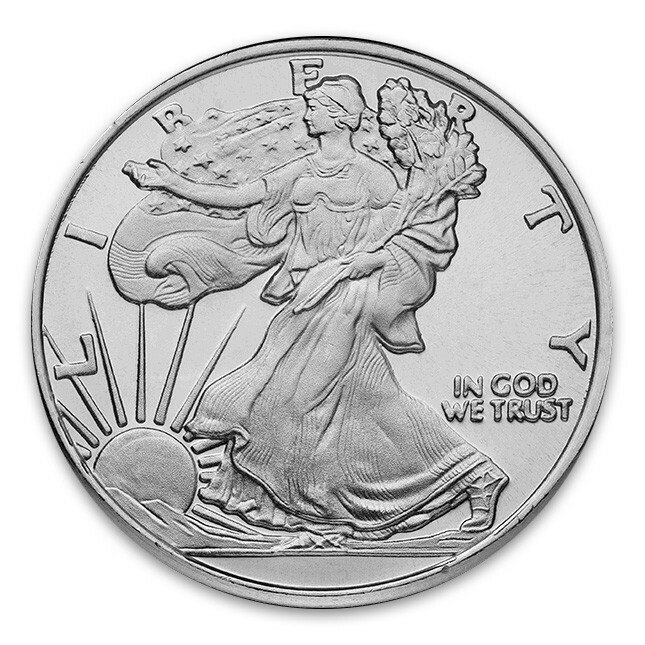 Above her is stamped the word “LIBERTY,” and just to the right is “IN GOD WE TRUST.” The design honors Adolph Weinman's famous 1916 design of the Walking Liberty Half Dollar, which is also honored on the American Silver Eagle. On the back of the round is the American eagle, adorned with a heraldic shield. In the eagle's talons it clutches an olive branch and bunch of arrows, the traditional symbols of peace and war. 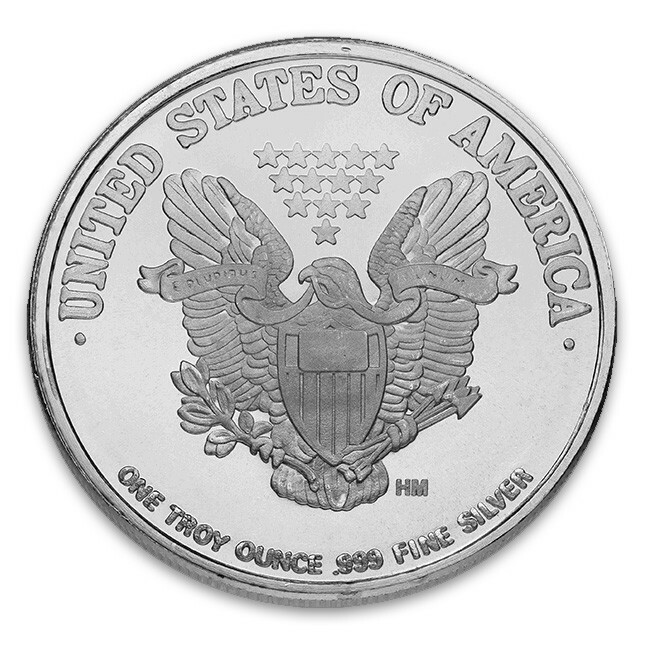 Above the eagle is a field of thirteen stars, representing the original thirteen colonies, and the text “UNITED STATES OF AMERICA.” On the bottom is displayed critical information about the round's weight, purity and metal type: “ONE TROY OUNCE .999 FINE SILVER.” The Highland Mint mark is also present (the “HM”). As low as $1.05 over spot!